Managing partner is the title given to the person that has shares in the business but also takes the lead in daily operations. It is the highest possible title for a manager. The role of the managing partner is essentially to be the liaison between the other partners and the rest of the business. It is the MP’s job to report on the general running of the business and to implement the decisions made by the other partners or directors. Despite being a partner, the MP does not necessarily have the final say over business decisions. In most cases, the other partners have to agree on the major business decisions first. How much power the MP has to make these business decisions depends on the organizational structure. If the other partners in the company are silent partners, then the managing partner will have more freedom to implement decisions. A silent partner has shares in the business but is not involved in the daily running of the business. If the other partners are not silent or if there is a board of directors, then the managing partner has to get approval from the other partners or directors. The board of directors is a group of people that have been chosen to oversee the company’s progress in the interest of the shareholders. A board of directors is most common in a public company. Another important aspect of the managing partner position is their liability in a LLC. LLC stands for Limited Liability Company. This business status limits the legal liabilities of the shareholders’ personal assets. Instead, these liabilities are carried by the business. However, any assets or persons that are actively involved in the business are not protected from legal liabilities. This is where the managing partner enters a gray zone. Since the managing partner is actively involved in the daily operations, he or she does not receive the same legal status as the other partners in the LLC. 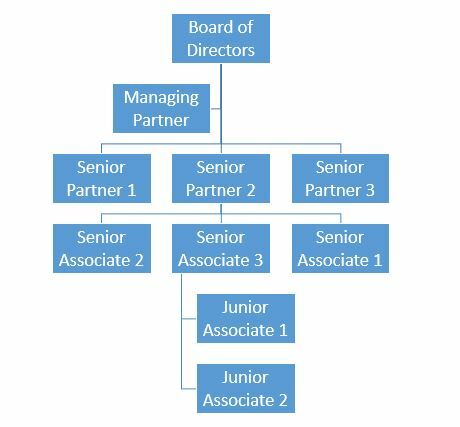 Below is an example of a part of an organizational chart with a managing partner. 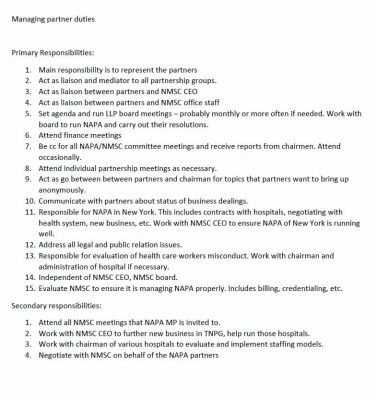 Below is an example of the job description of a managing partner. It is taken from the North American Partners in Anesthesia. 1. 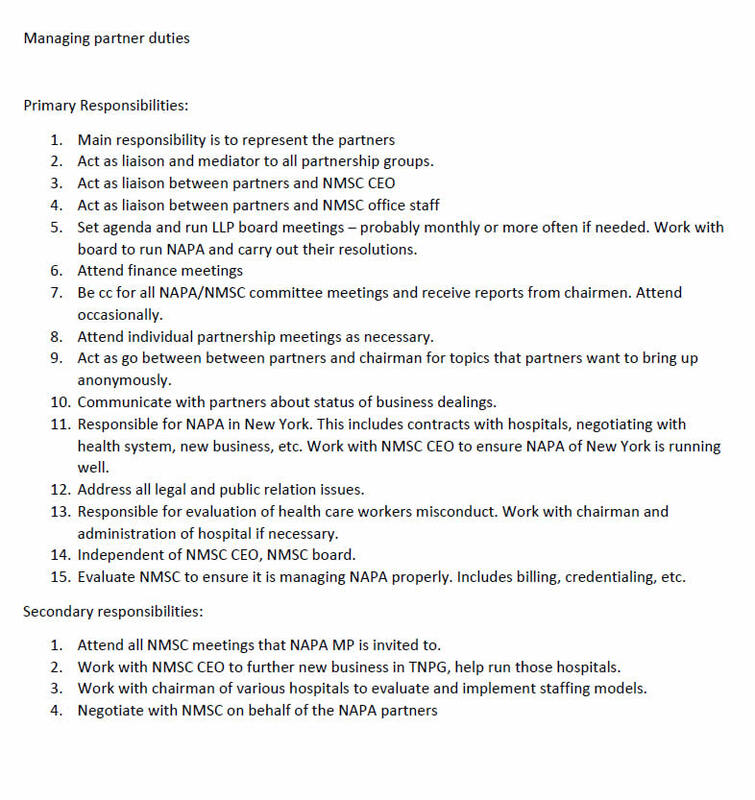 Is the Managing Partner responsible for appointing new members to the Board of Directors? A. Yes, the Managing Partner has an advisory role in the staff of the business. B. No, the Board of Directors is appointed by the shareholders, not management. C. No, the senior partners vote together for a new member of the Board of Directors. 2. The silent partners of a company are unsatisfied with the annual report. The annual report shows that the company has not reached its target revenue. Is reaching the target revenue the responsibility of the Managing Partner or the other managers in the company? A. Writing the report is the responsibility of the Managing Partner but achieving the target revenue is the responsibility of the other managers. B. The Managing Partner and other managers have equal responsibility for reaching the target revenue. C. The Managing Partner is responsible for reaching the target revenue because the other managers are overseen by the Managing Partner. 3. Can a Managing Partner also be a silent partner? A. No, silent partners are not involved in the daily operations of the business, so they cannot be the managing partner. B. No, silent partners can only serve on the Board of Directors. C. Yes, silent partners can have double duty as a Managing Partner.